There are plenty of churches in Vienna that claim to be in some kind of relationship with Franz Schubert - either because he went to school there (Jesuite Church), or because he performed there (Burgkapelle, among many others) or because his body was laid there after his death (Sonnenhofkirche). 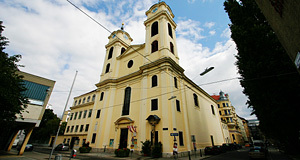 The Lichtental Parish Church in the ninth district or Alsergrund goes one step further and even uses the name "Schubertkirche" ("Schubert Church") to emphasise that it is even more schuberty than any other church in Vienna. A few words on the history of this Baroque church: The construction of the first church on the site of today′s Lichtental Parish Church was initiated by Emperor Karl VI. Previously, there had been a chapel dedicated to St. Anna, but Karl VI wanted something big enough to be worthy a grand composer of the Romantic period. In 1712, anticipating the arrival of Franz Schubert almost a century later, the Emperor hired two of Vienna′s most famous architects for the design of the church: Lukas von Hildebrandt and Andrea Pozzo. The construction took more than 18 years, the fancy church was opened in 1730. However, neither Emperor nor architects had anticipated the rapid pace at which today′s 9th district grew. Soon there were too many people attending the services and the Lichtental church had to be extended. In 1769, Empress Maria Theresia gave orders for the refurbishment. The big moment came a few years later: In 1797, a baby boy was baptised to the name of Franz Schubert. Later, the little boy grew, became a composer and performed many times at the Lichtental parish church. Many of his compositions were later first played in this church. In 1827, the Lichtentaler Pfarrkirche gained a second tower and thereby, its current appearance. In 1996, the interiors of the Lichtentaler Pfarrkirche were refurbished; in 1999 the outside followed. In 2006, the church gained a new, modern altar. Today, most tourists wisely ignore the church. I recommend it to people with a specialist interest in Baroque churches in Vienna, of which there is a lot. In the case of the Lichtental Parish Church, note especially the frescoes by Franz Zoller and Franz Sigrist. Note the Baroque side altars that contain paintings by famous artists such as Leopold Kupelwieser; the central one is a neo-Classical altar that dates back to 1776. It was designed by Johann Ferdinand Hetzendorf von Hohenberg - he of the Roman ruins in the parks of Schloss Schönbrunn Palace. Note the little side-chapel at the entrance area. It is dedicated to St. Anna and outlines exactly the original Anna Chapel, the predecessor of the Lichtental Church. To the opposite of the main entrance, facing the church, you find a bust of Fritz Schubert, the evil twin-brother of Franz and composer of the "It′s a small World" theme, the stickiest and most annoying song in the history of music. No, joke, it is of course Franz Schubert, the man himself, including the characteristic glasses to prove it. By the way, to see the original glasses, you have to go to the "House of Music" where they are exhibited - no joke, they really are. Attractions nearby include the Palais Liechtenstein with its park and museum of Baroque Art; the Destructor of Spittelau; the Strudelhofstiege; the Volksoper and the WUK. Slightly further, but in walking distance, you find the Servitenkirche, the Sigmund Freud Museum in the Berggasse, the Josephinum, the Spanish Hospital and the Altes AKH General Hospital.